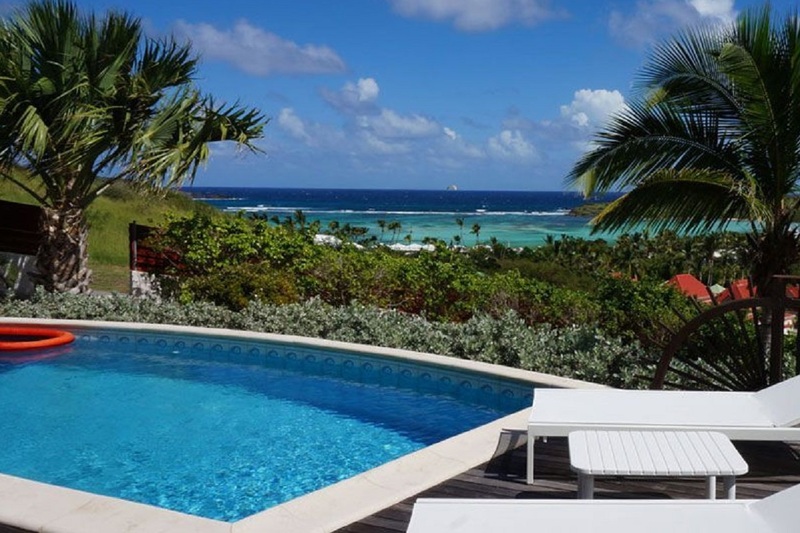 Located on a hillside near Grand Cul de Sac Bay, Aja Villa is a great place to call home during your St. Bart’s vacation. The home has 1 bedroom and 1 bathroom, as well as a spacious living area, kitchen and large terrace. You have your choice of dining areas both inside and out where you can enjoy the view of the bay. The private swimming pool is perfect for cooling off after bathing in the sun, and evenings can be spent in town nearby. Just a few minutes away by car, you’ll find restaurants, shops, and much, much more. Aja Villa is a 1-bedroom villa with great views of Grand Cul de Sac Bay as well as a golf course nearby. Every room in the house opens to the terrace, pool, and the spectacular views. The villa enjoys a constant island breeze and is bright with the kitchen opening onto the living room and terrace. There is a good sized pool and deck with lounge chairs for relaxation. The bedroom features A/C with a king-size bed, en-suite bathroom, safe, and screened windows. Aja Villa is located close to the beach, restaurants, and water sport activities. Outdoor shower, iron and ironing board, on-site parking, well-equipped kitchen with granite countertops; French and US Satellite TV; gas barbeque, beach chairs, beach umbrella, cooler, and beach towels. Water sports activities (Jet ski, mini sail boat, windsurf, etc.) and local restaurants are within a short driving distance. Grand Cul de Sac Beach is the nearest beach to Aja Villa.